There is an old saying that Texas is “heaven for men and dogs, but hell for women and oxen.” But the state’s history is chock-full of stories of female role models. Barbara Jordan. Ann Richards. 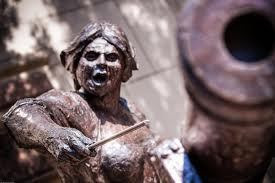 In downtown Austin, there’s a statue of Angelina Eberly, heroine of the Texas Archives War of 1842, firing a cannon and looking about 7 feet tall. In March 1842 a division of the Mexican army under Gen. Rafael Vásquez appeared at San Antonio demanding the surrender of the town; the Texans were not prepared to resist and withdrew. On March 10 President Sam Houston called an emergency session of the Texas Congress. Fearing that the Mexicans would move on Austin, he named Houston as the meetingplace. The citizens of Austin, fearful that the president wished to make Houston the capital, formed a vigilante committee of residents and warned department heads that any attempt to move state papers would be met with armed resistance. President Houston called the Seventh Congress into session at Washington-on-the-Brazos and at the end of December 1842 sent a company of rangers under Col. Thomas I. Smith and Capt. Eli Chandler to Austin with orders to remove the archives but not to resort to bloodshed. The Austin vigilantes were unprepared for the raid, and the rangers loaded the archives in wagons and drove away, but not before Mrs. Angelina Eberly fired a cannon at them. On January 1, 1843 the vigilance committee, under Capt. Mark B. Lewis, seized a cannon from the arsenal and overtook the wagons at Kenney's Fort on Brushy Creek. Only a few shots were fired before the rangers gave up the papers in order to avoid bloodshed. The archives were returned to Austin and remained there unmolested until Austin became the capital again in 1844. So, there you have it. A war in which the first shot was fired by a woman, and in which nobody gets killed, or even hurt. And all over archives. Well, to be fair, really over what was to be the capital of the then independent Republic of Texas. Another reason, along with Wendy Davis (and many others; see the addendum to this post), for me to love the Lone Star State. The photo is from the home page of an Austin based "psychedelic Americana band" called Archive War.